In a recent micro-post featuring a first-generation PANArt Hang retuned by Ralf van den Bor, of Ayasa, we commented on the fact that PANArt have, in recent years, somewhat (completely) turned their backs on owners of earlier Hang models, withdrawing any, and all offers of maintenance work. Something that has forced owners of earlier-made Hang (anything built prior to the Free-Integral Hang if we recall correctly) to seek out, and go cap-in-hand to, the makers of other Handpan, when in need of tuning services. Over the last few years we’ve seen an increasing number of Hang videos over at Youtube featuring Hang retuned by other tuners. Which begs the question we first saw put forward by long-serving moderator over of Handpan.org, Ray "Greenoak" Ford: Is a Hang (or any Handpan for that matter) retuned by anybody other than its original maker, still the same instrument? Is a Hang, retuned by anybody other than either Felix, or Sabina, over at PANArt, still truly a PANArt Hang? The ship of Theseus, also known as Theseus' paradox, is a thought experiment that raises the question of whether an object that has had all of its components replaced remains fundamentally the same object. The paradox is most notably recorded by Plutarch in Life of Theseus from the late first century. 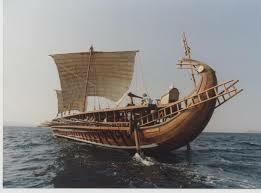 Plutarch asked whether a ship that had been restored by replacing every single wooden part remained the same ship. Plutarch thus questions whether the ship would remain the same if it were entirely replaced, piece by piece. Centuries later, the philosopher Thomas Hobbes introduced a further puzzle, wondering what would happen if the original planks were gathered up after they were replaced, and used to build a second ship. Hobbes asked which ship, if either, would be the original Ship of Theseus. Does the magic of any given Handpan lie within its base material as PANArt might be inclined to tell you? Or is it within the wielding of the hammer? Does each individual tuner have their own unique, and distinct signature? And if so, if a Hang is retuned anywhere else other than by the side of a babbling river in a picture-postcard setting some-place in Bern, by anybody other than the original Swiss inventors - how much of its original innate "Hang-ness" (if such a thing exists); still remains?